Thank you for responding regarding my earlier post, much appreciated. 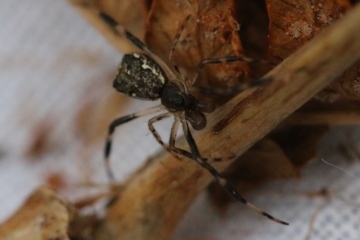 As far as can be told from the photograph, this is probably Steatoda grossa. It is not the 'noble false widow' which causes all the ill-informed scare mongering in the media. Steatoda grossa is widespread and frequent in the southwest, and in recent years has also become more common on the southeast. 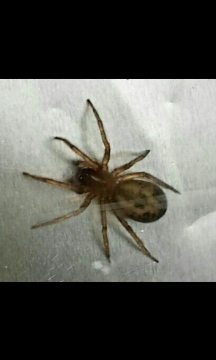 Is this a False Widow? 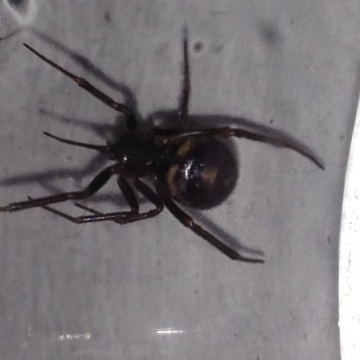 Just found this is my bathroom, is it a False Widow? Should I do anything if it is? Postcode CF83. 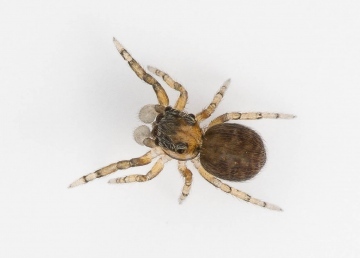 No, this is Amaurobius similis, a very common spider of cracks in walls, fences, eaves etc in gardens and buildings. Please provide a full postcode or Ordnance Survey grid reference and date of the record so that it can be added to the recording scheme. Found this spider in our house whilst having the kitchen pulled out a couple of months ago. Ever since this capture we have noticed many more of these spiders in and around the house. My untrained, novice eye leads me to believe it to be a Steatoda nobilis (False widow). They seem to love the ivy that grows on the wall in my yard as we have spotted a few there. Just thought it was intesresting due to most of the data regards distribution i've seen showing that they are primarily spotted in the south. So for you northern folk, if this is indeed a 'False Widow' then they are amongst us. This was found in my house by me in Bingley West Yorkshire. For those interested. I released it not too far from the house. Not bothered me before and not going to start being terrified of nothing starting now. Yes it did seem rather out of place to me too. It was about 8mm long, which seems to make it a bit bigger than the species you suggest, from what I've read. When I first spotted it I thought it was perhaps a housefly of some kind until I got closer! Mainly, it was the short and very robust looking front legs which struck me, as well as the size - much bigger than the little zebra spiders I'm more used to seeing. Wish I'd studied it for longer, but I was just turning in for the night! This is an unlikely spider to find on a ceiling. What size was it? Are you sure it wasn't Pseudeuophyrs lanigera? I found a Marpissa muscosa indoors on the ceiling yesterday. I've not seen one before, but it seemed quite distinctive and easy to identify from the books. It was quite lively once I caught it so I couldn't get a photo before I liberated it in the garden. If you would like to add it to the records the location is TQ383939 in north east London, date 16/03/2014. Please could you say where you found this spider Laura. 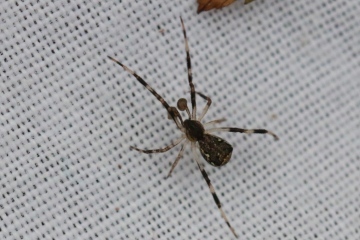 It looks like Argiope argentata which is not a UK species! 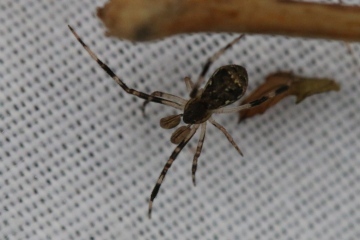 Juvenile male Episinus, probably angulatus. Grateful to learn if this can be identified. It was in my garden this afternoon. I've looked through Roberts but can't find a spider to match. Thanks. 'Found a very tiny jumper this morning on the beach in Sussex So tiny at about 1.5mm it must be the smallest species of Salticid in Britain when it is adult? Is there a littler one!